I find it hard to believe that my recent visit to Birzeit University (BZU) lasted only five weeks – the hills, the sky, the soft, sandy colour of local stones, the colleagues who hosted me, the students I connected with, they all feel so familiar, as if I had known both people and landscape for a long time. And yet it was indeed only five weeks! I arrived in BZU early May, in the company of my husband Julian Field, thanks to an academic scholarship provided by the Fulbright Commission, yet in no small part as well thanks to the effort and hospitality of Prof. Randa Nasser, her colleagues at the Sociology Department, and Prof. Amir Khalil with External Academic Relations. And I left only recently, close to mid-June, a few days short of the end of Ramadan. Early May was a difficult time -- one that combined a brutal assault on the people of Gaza[i] with the stunning move of the US Embassy from Tel Aviv to Jerusalem[ii]. It became quite a challenge for me, a privileged visiting professor and international, to imagine exactly how I could become involved with the University community in any useful way given the circumstances. And yet involved I became, one step at a time, as I strived to develop a feel for potential openings while remaining sensitive to the slow pace of Palestine, the awe-inspiring hills surrounding Birzeit, and a background of continuing uncertainty about the future that imposes itself on everyday life. Still, in only five weeks I did and experienced so much, I connected with colleagues engaged in developing a new undergraduate course in the sociology of health and who were interested in my experience in the field, and provided them with as much material and tips as I possibly could; I connected with graduate students from Birzeit’s unique PhD program in Social Sciences, students who were eager to discuss with me their thesis ideas in the field of critical pedagogy; I connected with undergraduate students interested in my advising them on study abroad opportunities so that, in the words of one colleague, they could “step out of the ghetto,” at least for a while; I connected with members of BZU centres and institutes who, to my delight, were open to discussing collaborative research and publication opportunities; and finally, I had the pleasure to meet people committed to supporting and protecting the right of Palestinian students to pursue their dreams of a university education, despite the unforgiving constraints of the longest military occupation in modern history. 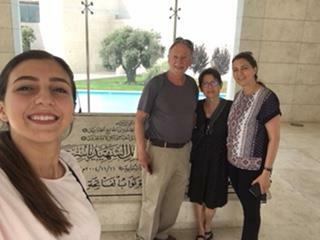 From right to left, Ghada, Nataly’s mom, Claudia, Julian (Claudia’s husband) and Nataly, spending an afternoon at the Arafat Museum in Ramallah. What stood out however was the extraordinary warmth, caring nature and hospitality of so many people I met, too many to thank and name. These included University staff such as Rula Shaar, house manager and guardian angel throughout our stay, who welcomed us at her family home in Nablus and spent two full days touring us around the area. It also included students such as Nataly Hinn, who soon after I arrived and still feeling quite lost in a new geographic, cultural and linguistic environment, missed her bus to walk me safely to my meeting with Prof. Amir, and later hosted us with a lovely Palestinian meal at her family home in Ramallah. I would like to believe that my presence at Birzeit was useful to the handful of individuals I had the chance to meet and connect with, but I am certain that I learned more from them than whatever they may have received from me. Indeed, I experienced firsthand the environment of a unique University community and the steadfastness of the Palestinian people[iii], and in so doing I renewed my long-standing conviction about the justice of their plight[iv]. If I am now able to be a better advocate of their cause and communicator of their story, then these five weeks will have been worthwhile.